Facebook Graph Search: How the social network's new search engine could change the way you use the Web. How the social network’s new search engine could change the way you use the Web. 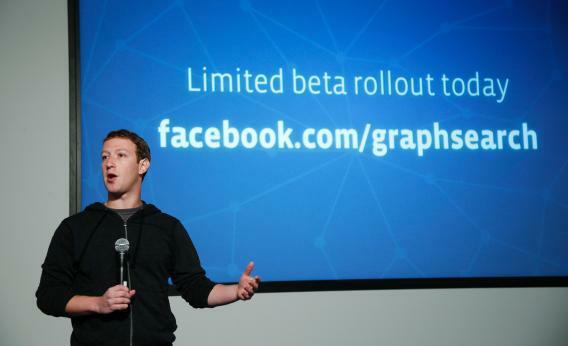 Facebook Chairman and Chief Executive Mark Zuckerberg introduces Graph Search. Photo by Stephen Lam/Getty Images. The deeper issue, though, is that Facebook has never explained why we’re supposed to be liking and checking in and tagging. Some people do this stuff as a means of self-expression—your profile is your face on the Web, so you like Arcade Fire and you check in to that new vegan place because you want to make a statement about who you are. But for most of us liking is just a lot of trouble. We use Facebook to keep in touch with friends. Unlike Google or Amazon, Facebook is a place to have fun, not a utility where you make decisions about what to buy or where to go. And for some critics, Facebook’s inherent purposelessness seems like a huge shortcoming—if it’s just for fun, then however big it gets, it’s vulnerable to the next fun thing to come along (Twitter, Instagram, Snapchat, Pinterest, or something else). I actually tried that query, and it worked—meaning, Facebook did understand what I was looking for. But it didn’t produce any results—that is, my dream woman doesn’t exist, or, if she does, she hasn’t liked Girls and Arcade Fire on Facebook. When you get access to the new search engine—it’s being rolled out to Facebook’s users “very slowly,” Mark Zuckerberg said at today’s launch event; sign up for the wait list here—I suspect that you, like me, will spend a half hour typing in many such odd juxtapositions of people, places, and things. You’ll immediately notice Facebook search’s amazing user interface and flexibility. You’ll also spot one glaring problem: The search results aren’t that good. While many of the answers I got back were on the money, a lot of them were strange. For example, when I searched for “Restaurants liked by people who live in San Francisco, California” and “Restaurants liked by people who live in Palo Alto, California” I got the same top result: Facebook’s corporate cafeteria, the Facebook Culinary Team. Now, I’ve had a couple good sandwiches at Facebook’s café, but I don’t remember ever being knocked off my feet. Something with the search engine seemed screwy. These sometimes strange results aren’t fatal. Zuckerberg and others who worked on the new engine stressed that they’re rolling it out so slowly in part because they need a lot more users to improve its results. Search algorithms improve as more people use them, which I’d bank on happening here. And if that does happen, Facebook search could become an important part of your daily Web scrounging—I can imagine using it as my first stop to find hotels, restaurants, doctors, and maybe even the consumer products I now go to Amazon for. This method of searching is instantly intuitive. After just a few queries, I started asking the engine for more and more complicated things, just to see if it could keep up. I tried: “My friends of friends who work in Palo Alto, California and are from California and are male and who like Indian restaurants.” It didn’t have any trouble—I got a list of 6 people. The most interesting searches weren’t necessarily the most complicated, but those that asked Facebook to combine its knowledge in ways that other sites can’t. In an effort to suss out authentic cuisine, I tried, “Mexican restaurants in New York liked by people from Mexico.” That’s something I can’t ask of Yelp, my go-to restaurant finder. Unfortunately, while Facebook understood my search, it only had one result (Cariño Restaurant and Cantina). Some others that worked better were: “Restaurants liked by my friends who like Weight Watchers” (a sushi place), “Bands liked by people who like Django Unchained” (Beirut and The Shins), and “videos liked by my friends who like Arrested Development” (a gallery of several funny Web videos, and several unfunny ones, too, including one of the Japanese earthquake). As you play with the engine, you quickly find its limits. At the moment, Facebook only recognizes a few kinds of objects (among them restaurants, hotels, TV shows, and movies) and a small number of verbs. I found myself wishing that it was more expansive: If I could ask it for “running shoes liked by people who have run marathons,” I’d be able to get the perfect sneakers, and if it could answer “cameras used by my friends who take the best photos,” I’d never have to consult a tech reviewer again. Facebook also can’t do negation. To find a dentist who might be kind to scaredy cats, I’d like to type in “dentists liked by people who don’t like horror movies.” But that’s not possible today. These limitations shouldn’t be permanent, though. When I ran some of these queries by Lars Rasmussen, one of the lead engineers on the search engine, he said expanding the pool of nouns and verbs is the project’s long-term goal. There’s no technical reason why Facebook couldn’t answer questions about thousands or maybe millions of kinds of objects one day. But there is one social hurdle: People might not want their likes and dislikes to be searchable. The new search engine obeys all of Facebook’s privacy rules—it will only show you data that you’re allowed to see. That means it will get more useful as more people share more information with a wider audience. And if people make more stuff private, the engine will be a bust. “There’s a question about whether the very presence of a search engine will make people share more or less,” Rasmussen said. You could imagine either scenario: Now that your info is searchable, you might be more reluctant to like stuff or to make your likes public, because you don’t want random people to find you in their search results. On the other hand, Rasmussen says, if you know your data is going to be used to recommend your favorite places to others, you might be more tempted to compulsively like or check-in to places you think your friends should know about. Facebook’s search engine brings its rivalry with Google into stark relief, especially when you consider that Facebook is using Bing as a fallback—when it can’t find you good social results, it shows you Web results from Bing. As it is today, Facebook’s new search shouldn’t send anyone at Google into a panic. No one is going to use this as a substitute for good old Web search. If anyone should be worried about Facebook’s search right now, it’s Yelp, Tripadvisor, LinkedIn and other specialty social and review sites. But today’s Facebook search is only the first version, and as long as users cooperate, it’s bound to improve dramatically. It’s wise to remember, too, that Facebook doesn’t have to beat Google’s search engine to hurt Google as a business. If Facebook search becomes only the second most useful site on the Web, it would add to the social network’s existing role as the Web’s biggest time-waster. In other words, if Facebook perfects its vision of search, the social network would be fun and useful, all in one. That would be a worth a lot of billions.